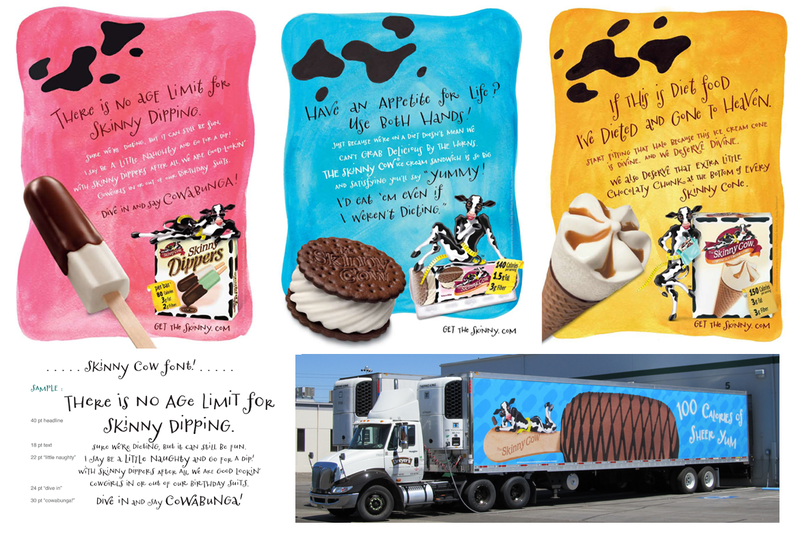 Nestle commissioned us to create custom lettering & backgrounds for their Skinny Cow print ads. They additionally requested a font version mimicking the handlettering for use throughout the ad campaign. The custom font, christened “Skinny Cow” by the client, featured multiple alternate glyphs which were programmed to appear organically set in an OpenType format. This font, licensed exclusively to Nestle, was employed extensively on their website, billboards, delivery trucks, point of purchase displays, print & online ads. Want your own exclusive or nonexclusive typeface? Different licensing options available. Let us know and we can make it happen. Remember you don’t have to share if you don’t want to to.